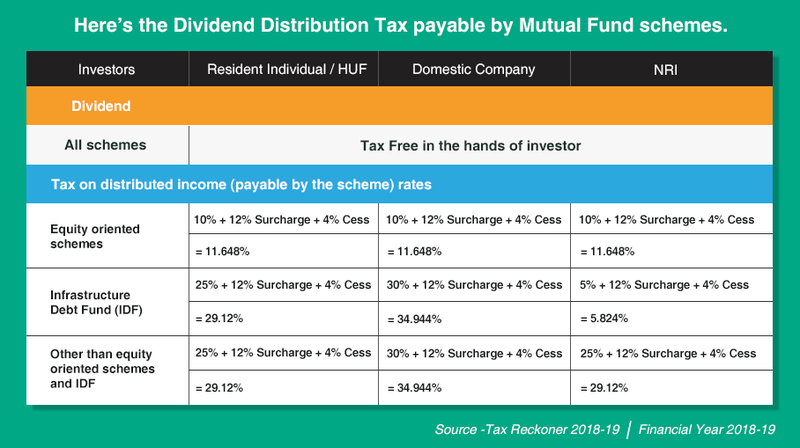 Dividends from Mutual Fund schemes are tax-free in the hands of the investor but are subject to Dividend Distribution Tax (DDT) at source. DDT paid by the scheme reduces the distributable surplus available for investors. Currently equity-oriented schemes (schemes with >=65% allocation to equities) are subject to 10%DDT along with 12% surcharge and 4% cess, making effective DDT to be 11.648% for all types of investors whether resident Indians, NRIs or domestic companies. Non-equity-oriented schemes are subject to 25%DDT along with 12%surcharge and 4%cess, making effective DDT to be 29.12% for both resident Indians and NRIs. Infrastructure Debt Funds that invest in the infrastructure sector are subject to DDT of 25% for Resident Individuals and 5% for NRIs making effective DDT to be 29.12% and 5.824% respectively. Since dividends are distributed out of the profit made by a scheme, a higher DDT reduces the post-tax dividend available to investors. It may be wiser to opt for growth option if you are not looking for dividends as a source of income from your Mutual Fund investments. Going for a Systematic Withdrawal Plan (SWP) would be a better thing to do if you need regular cash inflow. What are the taxation rules and implications in Mutual Funds?